One Aftermarket Replacement Hydraulic Cylinder Seal Kit that fits Ford Skid Steer Loader Models : CL-30, CL-40. Rod: 1 1/4", Bore: 2 1/2". Please Note: Your Seal Kit will look different. Our processing system is automated. Thank you for your continued patronage. We carry parts for Engines, Transmissions, Front & Rear Axles, Hitch & Drawbars, Undercarriages, Final Drives, Seats, Bearings, Cups, Cones, Seals, Discs, Couplers, Gears, Brakes, Pressure Plates, Pilot & Throw Out Bearings, Ring & Pinions, Gaskets, Decals and MORE for most high wear items. We also carry replacement parts for the Boom Cylinder (Seal Kits, Tubes, Glands, Pistons, Rods). 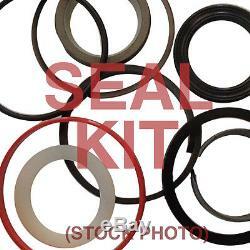 The item "22-606 Hydraulic Cylinder Seal Kit fits Ford Skid Steer Loader CL-30 CL-40" is in sale since Wednesday, December 11, 2013. This item is in the category "Business & Industrial\Heavy Equipment, Parts & Attachments\Heavy Equipment Parts & Accessories\Farm Implement Parts".